In this exclusive audio interview Emmy Winner Charlotte Robinson host of OUTTAKE VOICES™ talks with Reverend Richard Emmanuel, Founder of The Church, a non-profit organization in East Gloucester, MA, that is dedicated to raising individual and collective consciousness and increasing spiritual awareness. We called on Emmanuel, a visionary and dedicated political activist to give us his brutally honest spin on what 2012 may bring our LGBT community and more. 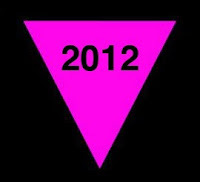 Emmanuel also addresses ‘2012: end of the world as we know it’ theories, the Obama administration, the controversy surrounding Bradley Manning, marriage equality and LGBTQ teens who are up to four times more likely to attempt suicide than their heterosexual peers.